The following table shows ratio of prices of packs of potato chips and banana chips and the total revenue generated by selling the chips, over the given years. 1. 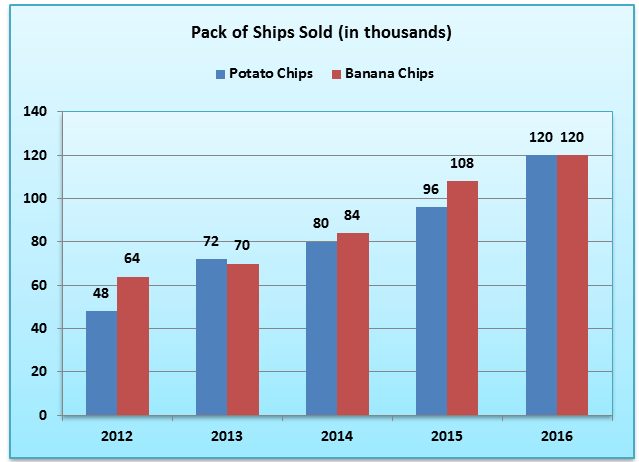 What is the percentage increase in revenue generated by selling only banana chips in 2015 as compared to 2012? 2. If the sale of both potato chips and banana chips in 2017 goes up by 10% than that in 2016, and if potato and banana chips are sold at Rs. 23 and Rs. 25 per pack respectively, then what will be the total revenue generated by selling both types of chips in 2017 (in thousand rupees)? 3. What is the difference in revenues generated by selling potato chips and banana chips in the year 2013? 4. In 2015, the company launched a marketing campaign to increase sales of potato chips. The aim was to generate a minimum revenue of Rs. 6,000,000 in the year 2020. Also, the price of a packet must not be more than Rs. 30. 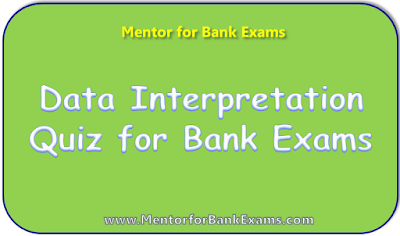 What is the minimum percentage increase in sales of potato chips from 2015 to 2020, so that this objective is achieved? 5. 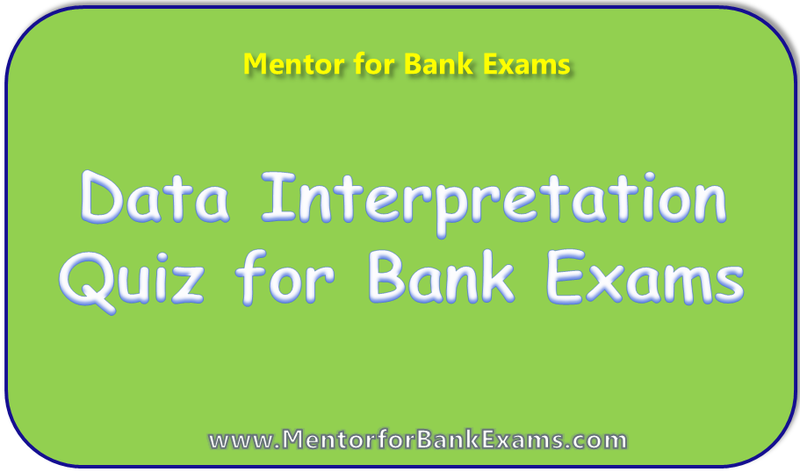 What is the approximate difference between average number of packs of potato chips sold per year over the years 2012 to 2014 and the average number of packs of banana chips sold per year over the years 2014 to 2016? 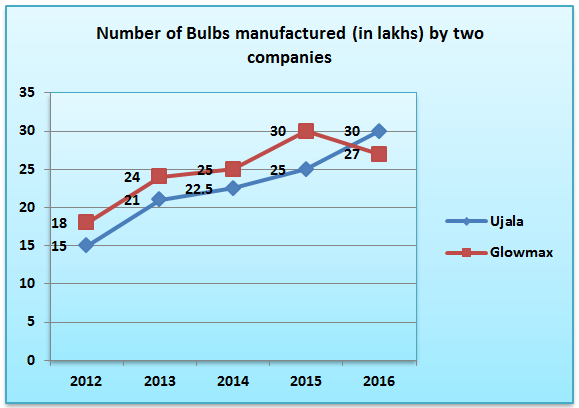 The line graph below shows number of bulbs produced (in lakh units) by two companies, Ujala and Glowmax, over the years 2012 to 2016. The manufactured bulbs undergo an extremely rigorous quality check and the bulbs not meeting quality standards are labelled defective. The remaining bulbs are labeled as fit for sale. The following table shows the percentage of defective bulbs out of total manufactured bulbs and percentage of bulbs sold out of the total bulbs fit for sale, for the two companies. 6. If each bulb of Ujala is sold for Rs. 60, then what is the revenue generated byUjala (in million Rs.) in the year 2015 through selling bulbs? 7. What is the ratio of bulbs sold by Ujala and that by Glowmax in the year 2013? 8. What is the difference between number of bulbs sold of Ujala and Glowmax in the year 2014 (in lakh units)? 9. What is the ratio of Number of bulbs of Glowmax termed as defective in 2014 and the bulbs of Ujala termed as defective in 2012? 10. What is the percentage increase in number of bulbs of Glowmax sold in 2015 as compared to those sold in 2014? 1. A) Ratio of prices of potato chips to banana chips sold in 2012 is 4 : 3. Let’s assume that the respective prices are 4x and 3x. Now, Ratio of prices of potato chips to banana chips sold in 2015 is 1 : 1. Let’s assume that the respective prices are x and x. Both the sales go up by 10% in 2017. Now, potato and banana chips are sold at Rs. 23 and Rs. 25 per pack respectively. Ratio of prices of potato chips to banana chips sold in 2013 is 6 : 5. Let’s assume that the respective prices are 6x and 5x. The maximum price of a packet can be Rs. 30.